Your teeth are an important part of your overall health. Decayed, damaged, misaligned, or lost teeth affect more than just your smile; they can harm many other aspects of your lifestyle and well-being. At Newman Family Dentistry, we want to help you keep your mouth healthy. If you have experienced extensive damage to your teeth in either your upper or lower jaw, you may need full mouth rehabilitation. Full mouth rehabilitation or reconstruction is a program of treatment used for mouths which have many intersecting issues, including possible injuries, loss of soft tissue or bone, infections, and decayed or damaged teeth. In those circumstances, the focus of our work is on rebuilding a strong, healthy smile. When you are suffering from tooth decay or from missing teeth, it can have an impact on all aspects of your health. Aside from the aesthetic issues with flawed teeth, poor dental health can cause pain, impair speech, and affect your ability to eat foods including fruits and vegetables. When teeth are missing for a long time, the bone and gums in the gap can wear away, and the teeth on either side of the gap and in the opposite jaw may lean in to fill the space, which changes your bite. There are even studies linking tooth loss to other health problems like arthritis and heart disease. Leaving severe dental problems untreated is detrimental to your overall health and can cause problems that last throughout your life. What Does Full Mouth Rehabilitation Entail? Make your health and comfort a priority. Schedule an appointment to discuss what a full mouth rehabilitation can do for you. Which procedures you will need and the details of our approach will depend on what we find at your initial exam and your priorities. 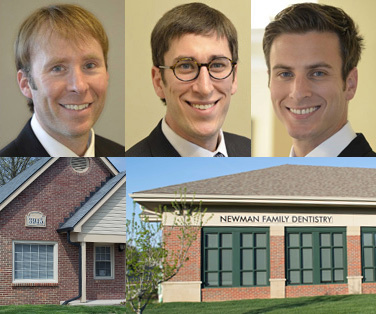 At your first visit at Newman Family Dentistry, one of our dentists will examine your teeth and discuss your concerns with you, as well as your relevant medical history. We will take x-rays and possibly other images of your teeth in order to get a detailed and accurate idea of your condition. All of this information will be incorporated into your treatment plan, which we will discuss with you to ensure that it meets your needs. The entire full mouth rehabilitation could take as little as a few visits or several months to complete depending on the procedures included in your plan. The first thing you need to do is schedule an appointment for an exam so the dentist can evaluate where you're at. We understand that untreated dental problems often stem from anxiety many patients have about visiting the dentist. This is very common, and at Newman Family Dentistry we'll do everything we can to make you feel comfortable and ease your nerves. During your exam and treatment, if there is anything we can do to put you at ease, please let us know. At Newman Family Dentistry, we aim to bring your teeth to their full health and functionality as well as to give you a glowing, carefree smile. Contact one of our offices today to schedule your initial exam and to discuss a full mouth reconstruction. We have two convenient locations in Carmel and Indianapolis.